When officials at Sage Park Middle School started a youth leadership program for black male students last year they were hoping to boost the self-esteem and build confidence to empower young men of color. “As we worked through the program kids and adults said ‘what about us? '” said Sage Park Principal Paul Cavaliere. So the school decided to open the workshops to all students in order to better reflect the racial and gender make up of the student body. On Thursday three groups of 50 students from the 6th, 7th and 8th grade participated in an exercise with Aric Jackson, a youth motivational speaker, who has been working with Sage Park since the program began. Jackson comes back to the school about every two months and the students in the program meet in smaller groups with their volunteer teachers about once a month in between to plan activities and projects. 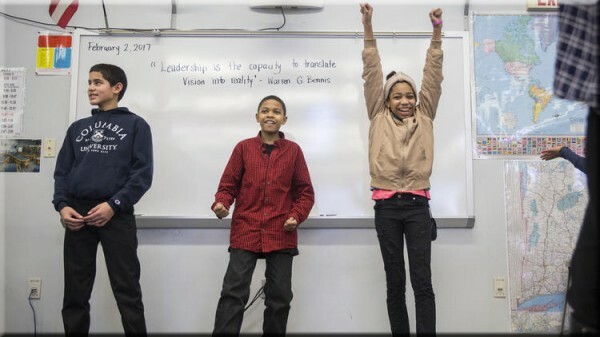 Thursday’s exercise was designed to help the students envision what kind of leader they want to be, embrace their dreams and learn how to present themselves as leaders, from the proper handshake and body language, to speaking and listening skills.